Over the last few years, we have cultivated a relationship with the NYC Audubon, resulting in biweekly Birding Tours of the park during migration. We've been delighted as our Audubon Guide Gabriel Willow teaches us about the avian life of NYC, and helps us spot some of these magnificent creatures up close. Now Gabriel shares his experiences in the park. We recently wrapped up another season of bird walks in Bryant Park. I have yet to analyze the numbers to determine how many species of birds we saw, or what their numbers were, but one bird in particularly was notably abundant. It's a species that is probably unfamiliar to most non-birders; it isn't as ubiquitous as the House Sparrows or Rock Pigeons that hang around the park and eat breadcrumbs; it isn't brightly colored and doesn't have its own baseball team like a Northern Cardinal or Baltimore Oriole. It's not fast or fierce like a falcon or hawk. But this little olive-colored bird has its own charms, and if you look carefully, you can see them strutting around in the flowerbeds and shrubbery of Bryant Park; occasionally they'll even walk out to peck around for food under tables and chairs in the park. The species is known as an Ovenbird. It's a type of wood-warbler, in the family Parulidae, but it's an unusual member of the family. Warblers are generally very small, colorful, tree-dwelling species that glean foliage for caterpillars and other insects. Ovenbirds, while a small bird, are large for warblers (around 6 inches long), and ground-dwelling. They look more like a thrush than a warbler, with their muted colors and spotted underparts. The scientific name of the Ovenbird is Seiurus aurocapilla, which means "golden-haired tail-shaker." Now that sounds like a fun bird! They have a golden-orange stripe down the top of their head; they don't really shake their tails more than any other bird, but they do often hold it cocked jauntily in the air. They have a distinctive gait as well: most ground-dwelling birds, like the similar-looking thrushes, hop. But Ovenbirds walk instead, or could even be said to strut: they often pause between each exaggerated jerky step, with one foot held in the air. "[The Golden-crowned Thrush] breeding places are in the interior or along the margins of shady woods watered by creeks and rivulets, and seldom visited by man, being of a shy and retiring disposition, so that its occurrence in the open parts of the country is very rare... The nest is so like an oven, that the children in many places call this species the "Oven Bird." 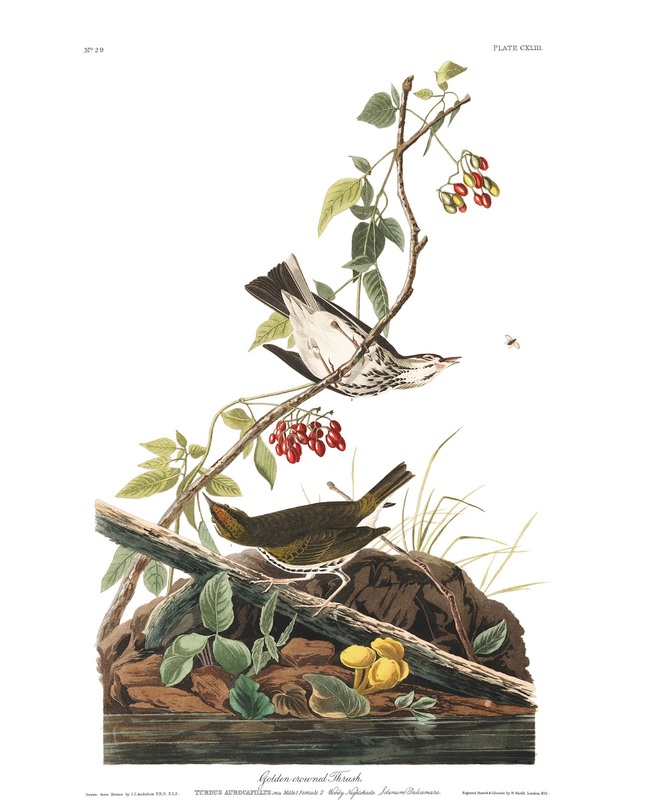 John J. Audubon's illustration of an Ovenbird. He made note of the common colloquial name of "Oven Bird," and how this is a reference to their nests. Today we think of ovens as a rectangular compartment in a stove with a hinged door, but at the time, ovens would have typically been an outdoor domed structure, made of brick or stone, with an opening on the side, not unlike a modern pizza oven. The domed nest of the Ovenbird, built on the ground of leaves and grass, has an entrance on the side, not unlike one of these old-fashioned bread ovens. Generally, as Audubon also noted, Ovenbirds are a bird of the deepest woodlands. They are a retiring species that lives in dense undergrowth, and so often go unseen, and are only known by their song (which is remarkably loud for the bird's size). 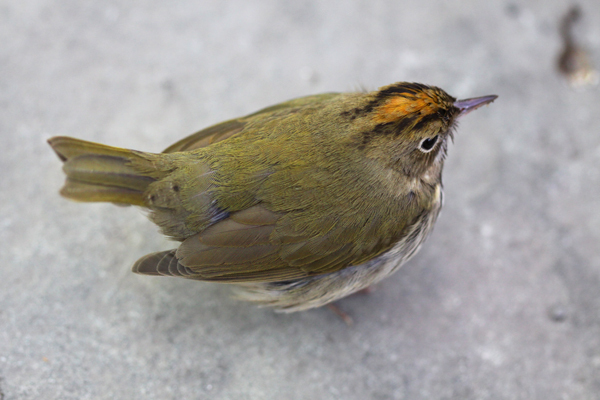 In rural areas or in large city parks like Central Park, Ovenbirds can seem like an uncommon species, because they're so hard to see in their preferred habitat. But in Bryant Park, it's a completely different story - Ovenbirds seem to be everywhere! Once you know what to look for, you will see them under nearly every hedge and shrub. They occasionally sing as well, although even with their loud voices they can struggle to make themselves heard above the cacophony of midtown traffic. Their song is often written as "teacher, teacher, teacher." It has an emphatic quality, getting louder as it progresses. At this time of year, dozens of Ovenbirds dwell in the park. I don't know if there's something particularly attractive about Bryant Park for Ovenbirds, or if the numbers of this species in the park reflect its overall abundance, but I have been amazed at the numbers we find on our bird walks. This past Thursday, I conservatively estimate we saw 25. Some small flowerbeds had four or five birds walking around. They also show very little fear of humans, and careful observation can reward with close views of seemingly unconcerned Ovenbirds walking right by your feet! Take the opportunity to admire their golden-olive back and the spiffy gold and black stripes down their head, and boldly spotted breast. They don't build their unique nests in Bryant Park, they only stop by during migration. In a few weeks most of them will have dispersed to their breeding grounds in denser woodlands elsewhere. But occasionally a few stick around the park's flower beds, and can be found into summer or even winter (when they normally would migrate to the southern US or Mexico). They just seem to love Bryant Park! And they are a reminder of what a truly unique location the park is for observing birds.